If you are an attorney and/or law firm pro bono coordinator and would like to accept a pro bono matter, please click here or contact Bruce Levine, Esquire, Pro Bono Coordinator blevine@dadelegalaid.org. 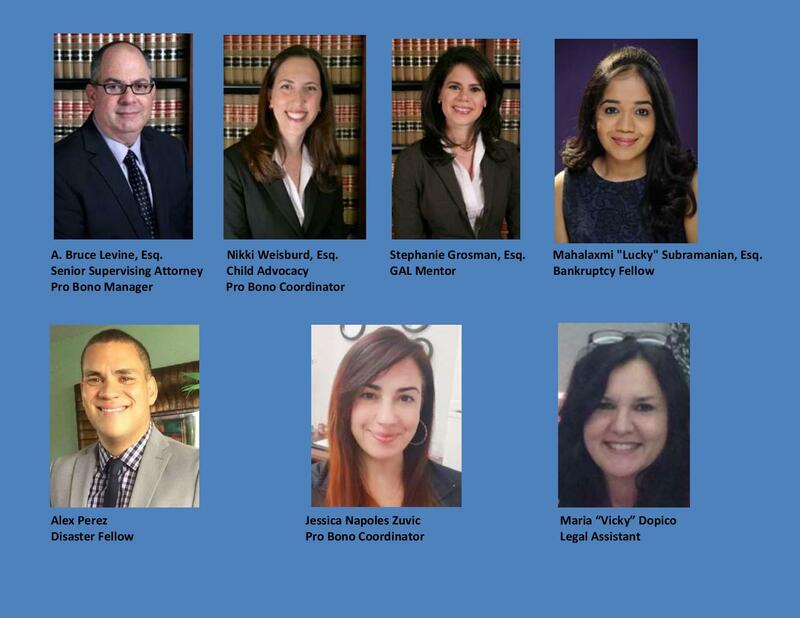 Dade Legal Aid offers a number of innovative and creative projects providing offering a wide array of pro bono service opportunities. The Florida Bar’s fee form includes a pro bono section to report your contributions toward the Supreme Court aspirational goals asking lawyers to provide 20 hours of pro bono service of donating $350 to a Legal Aid program each year. While providing pro bono is optional, filling out the pro bono reporting form on the statement is mandatory. If you are presently working on a case, please report your hours in order to receive pro bono credit. If you would like to accept a case or make a donation in lieu of accepting a case, please let us know. Once you accept a case, you will receive a mentor and materials upon request. If you are a law firm and would like to apply for Collective Satisfaction, please email psb@dadelegalaid.org. We can send you a sample form and assist you with completing it. If you are a student, retired, paralegal or paraprofessional, please consider donating your time with administrative tasks, client intake, translating and clinics. As attorneys, we took an Oath and solemnly swore to never reject, from any consideration, the cause of the defenseless or oppressed. In support of that Oath, Florida Bar Rule 4-6.1 encourages attorneys to give back at least 20 hours of pro bono service annually or make a financial contribution of $350 and to report these contributions. “Buy Ins” are encouraged, as these contributions enhance our budget and allow staff to provide critical services to the disadvantaged. Your contribution fulfills your pro bono requirement so long as you report your donation on your Bar Dues Statement. Click here to contribute. Individual, 100% Law Firm, CyPres, Corporate and other charitable donations help sustain the critical work of Dade Legal Aid. You and your firm may also designate Dade Legal Aid in your United Way Charitable Giving and in your Estate Planning. Can I collect a fee? Pro bono clients are indigent and should not be charged fees unless you determine that they are over income and not eligible for free services. Different agencies may have their own policies so if you receive a case from another agency check their policy but the general rule is that no client should ever be charged a fee. At times, however, volunteers may seek to recover fees and costs from opposing parties and statutorily mandated fees when appropriate and may remit these to us to help defray costs associated with administering the program. Please consider us when any type of fees or awards may arise and notify us immediately if you recover fees and/or costs. Who pays costs? All pro bono clients are low income and of limited means. The Affidavit of Indigency is the official court document that must be filed with the Clerk of Court in order for the Clerk to consider waiving filing fees, service of process, make copies or publish notices of action (for Bankruptcy Cases please use the following application forms to be considered for Waiver of Filing Fees or for Installment Payments of Filing Fee). We do not pay for these or other costs (depositions, expert witnesses, private investigators). If the client cannot pay and you need to expend these or other costs, you must obtain written pre-approval or your costs will NOT be reimbursed by the agency. Please seek to recover costs whenever possible, and please reimburse the program accordingly. IF THE CLIENT IS OVER INCOME FOR PRO BONO SERVICES PLEASE ADVISE US IMMEDIATELY. Mediators may be available to pro bono attorneys at no cost; again, please inform us if your matter may require a mediator. If your pro bono client is hearing-impaired, we provide interpreters. How many hours and how many cases am I expected to handle? As a guideline, each attorney is expected to perform a minimum of 20 hours of pro bono legal work per year and required to report hours to The Florida Bar OR contribute (“buy in”) $350.00 to Legal Aid. A firm may seek to complete their firm hours through “Collective Satisfaction” which allows the hours of one or more attorneys to be reported as a whole. I volunteer at a school or donate to several charities. Does that qualify as pro bono? The aspirational goal is to contribute at least 20 hours of pro bono legal services or contribute $350.00 annually to a Legal Aid organization. General community service such as tutoring or serving on a board is commendable; however, only legal work performed for an income eligible client or organization satisfies the pro bono requirement. I am not currently practicing law and have no office or staff. How can I help? Attorneys who are not actively practicing law but are licensed and in good standing are still able to assist by making phone calls or writing letters which may be of great importance to clients. Additionally, you may assist in areas such as client intakes, pro se clinics, legal hotlines, special projects, training, cases referral, mentoring and co-counsel under the supervision of a Legal Aid attorney. If you are licensed and want to perform pro bono services in small chunks of time please email psb@dadelegalaid.org. I’m a government attorney, handle PI or criminal cases. How can I help? Regardless of what type of law you practice, you can help. If you litigate, you can apply those skills in a permanent injunction hearing, uncontested divorce or general civil cases. If you practice corporate, business law or are a transactional attorney – you can draft a simple will for a veteran or handle a closing for a first time homeowner of Habitat for Humanity – we will find a case for you and train you in an area where needed most. We offer FREE CLE training, maintain a database of training materials and have seasoned attorneys willing to mentor upon request. What if I cannot accept the case referred to me? If you accept a case but later determine that you can no longer represent the client, please notify the program and client IMMEDIATELY so that the case can be reassigned. Once referred, the program deems the case accepted until notified otherwise. Due to the extremely high case load we are managing it is imperative that you notify us of acceptance of the case and the status of the case on a quarterly basis and upon completion including a total number of hours expended. How can I support pro bono legal services? Put Something Back is successful serving as a catalyst to match lawyers and firms from all backgrounds and areas of interest and expertise with all agencies in our region. We are encouraged by the growing number of attorneys joining the ranks of Put Something Back and hope to continue to grow our numbers. If you have ever accepted a case you know firsthand the ease of accessing cases, trainings and other opportunities. On behalf of Dade Legal Aid/Put Something Back and our grateful pro bono clients, thank you for your support!